Keith Haring was born on May 4, 1958 in Reading, Pennsylvania, and was raised nearby in Kutztown, Pennsylvania. After graduating from high school in 1976, Haring enrolled in the Ivy School of Professional Art in Pittsburgh but dropped out after 2 semesters. Later that year, Haring moved to New York City and enrolled in the School of Visual Arts. In New York, Haring discovered that he wanted to create public art, art that could be seen by all. Haring began to create “subway drawings” in white chalk on black paper that hung throughout the NYC subways. Subway riders would stop and talk to Haring while he created his chalk drawings. Haring began to become well known through out the art world. In April 1986, Haring opened the Pop Shop, a retail store in Soho selling merchandise with his artwork on them. Haring was diagnosed with Acquired Immune Deficiency Syndrome (AIDS) in 1988. 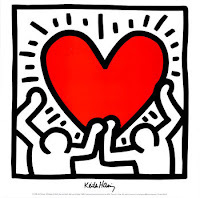 In 1989, he established the Keith Haring Foundation, to support children’s charities and AIDS related organizations. Click here to visit “Haring Kids” an educational website for children.